Home » UFO Day: What is World UFO Day 2018? What are the strangest alien sightings? UFO Day 2018 is here, with flying saucer enthusiasts and conspiracy theorists coming together to mark the big occasion. Every year on July 2, UFO lovers observe the day dedicated to flying saucers. The annual tradition was coined by UFO hunter Haktan Akdogan in 2001. This is a day for everyone to spend a little extra time to think, are we alone in the universe? On the WorldUFODay.com website it says: “There are several reasons why this day has found it’s way into the world. “One the first and foremost reasons is to raise awareness about the undoubted existence of UFOs and with that intelligent beings from outer space. “Also this day is used to encourage governments to declassify their knowledge about sightings throughout the history. Many governments, the US government for instance, are believed to have gained exclusive information about UFOs through their military departments. According to the official website, UFO day is “the day dedicated to the existence of Unidentified Flying Objects”. This is what the abbreviation UFO stands for. Most of the objects we can see in the sky can be explained. They are objects sent from earth, such as planes or satellites. Others have claimed to have seen objects which are not as easily explained. Sometimes an object is later explained or identified, but until then it keeps the status as a UFO. The name was created by the US Airforce in the 1940s, but they were more commonly known as flying saucers. You could celebrate it in many different ways including watching UFO movies, taking part in discussions about alien life, or indulging in some of the strangest sightings. What are some of the strangest UFO sightings? As mentioned above, the Roswell incident is perhaps one of the biggest unexplained mysterious in the world. People living in New Mexico in mid-1947 gave reports of seeing an unidentified object fly through the sky. After a while the mysterious object crashed in the desert, but was captured by Air Force surveillance officials. The Air Force reassured it was nothing but a weather balloon, but there were many conspiracy theories suggesting it was an extraterrestrial object. Before this came the Mount Rainier, Washington UFO sighting, which is said to have sparked the name flying saucers. This iconic sighting is considered the start of the “modern UFO era”. However, “the oldest UFO photograph ever taken” was snapped in 1870 atop the summit of Mount Washington. The World UFO Day Organisation said: “Certainly it was difficult to manipulate photos at that time, and remember, there were no flying objects then; at least, not from this world. Another picture posted to the website was taken in Cave Junction, Oregon. It was reportedly taken by a volunteer fireman, and a flying saucer is shown in the top right corner. 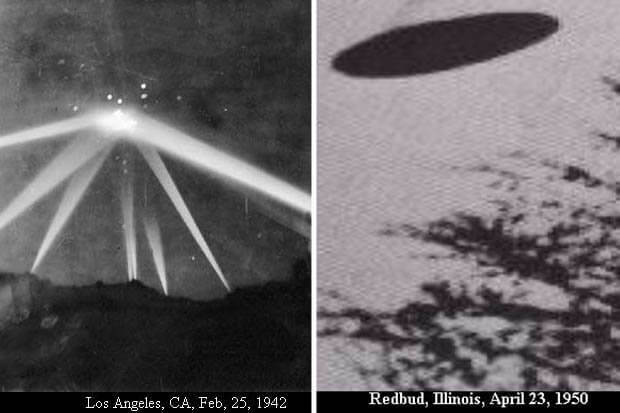 Other UFO sightings depicted in pictures include one from the Eiffel Tower in Paris, 1953, one from Czaplinek, Poland 1947, Salem in Massachusetts in 1952, Washington DC in 1952 and Redbud, Illinois 1950. But what about those who are already in the sky? Surely it’s easier for them to spot objects? One of the first commercial pilots to spot a potential UFO was flying from Houston to Atlanta on July 24, 1948. Pilots Chiles and Whitted saw a strange cigar-like object flying close by, and sometimes too close for comfort. It eventually disappeared, but the pilots agreed it was a long, thin craft with two rows of windows, which flowed blue. What made the sighting even more strange was several other witnesses at an airbase in George had seen a similar thing half an hour previously. The government ruled out it could have been a military or commercial flight.